(For those that don't know, the story is of a guy (The Man in the Chair) who is sitting listening to musicals on rather a glum day. He asks us if we'd like to hear his favorite record. It's an unknown show, "The Drowsy Chaperone" that is just a fun bit of fluff. It's the show that he listens to when he's blue. And as he plays the record,the musical comes to life on the stage before our eyes. The musical itself is (as the man expertly tells us) just a bit of fluff. It reminds me of the movie The Purple Rose of Cairo, the Woody Allen movie in which the stars of a 30's fluff movie come to life (and the star of the show falls into the world of the movie. The performances were not quite as sharp as one would expect from a musical (although I suspect it might be a choice of the director-- it's a remembered musical, an imagined musical, and it's very much the work of the Man in the Chair, who continues to interact with us, and with the musical world.) The sharpness choice is very well-done, but it struck me as remarkable. The guy who plays The Man in the Chair (who is also the author) was fantastic-- he carried the whole show on his shoulders, and pulled it off magnificently. He was funny, he was sensitive, he was sarcastic at the right moments, and droll at others. And don't get me wrong--the other characters were all expertly done. But for me, the most winning thing here was the concept. There's lots of very clever bits, and the concept is so smart and well-done. I don't want to ruin it for you by tellng the jokes, so I'm just saying that they make the most of their opportunities. You should definitely Go! It started as a play in the Toronto Fringe, and they've made the bigtime, deservedly. It's fresh, original, and funny-- and apparently it's losing box office, so if you want to see it, you should do it quickly. Before the theatre, frequently there must be dining. We went to B. Smith's on Restaurant Row, a kind of Louisiana backhome fine dining experience. I didn't realize it until looking at the website, but B. Smith is some kind of model/entrepreneur/television maven, a kind of black Martha Stewart. Not knowing anything about her until this moment, I thought the food was fun and good, but not sure if it was worthy of television stardom. Sorry B. Smith and your hordes of television fans. Better luck next time! 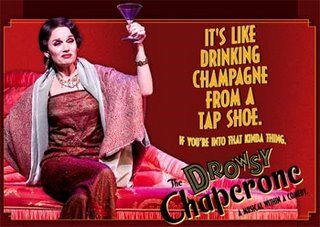 Comments on "The Drowsy Chaperone: a mini-review"